to a mate who I knew would understand my plight. remember girls just wanna have fun adult conversation? And Susan says, Amanda I remember that life. and girls just wanna have fun adult conversation. I rushed home and surveyed the scene. I had passionfruit which Susan had given me the week before, limes from the help-yourself basket at the gym and eggs from our clever chooks. 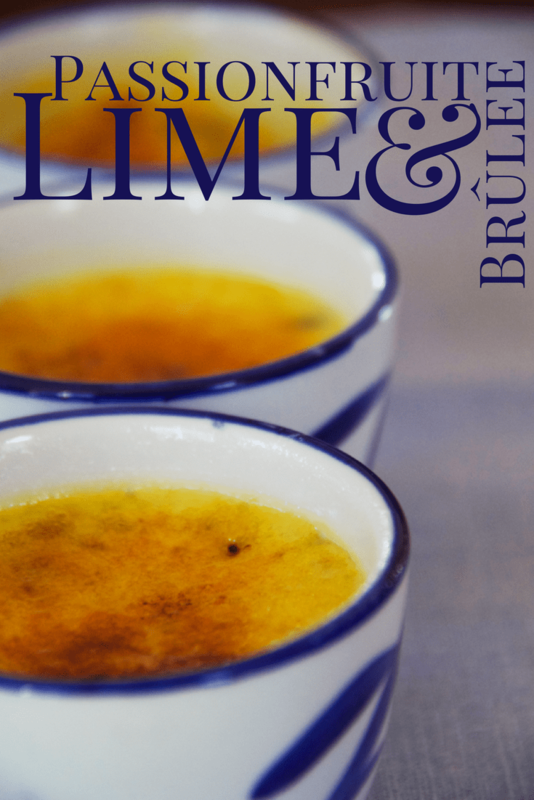 Et voilà passionfruit and lime brûlée! Preheat the oven to 140ºC fan forced. 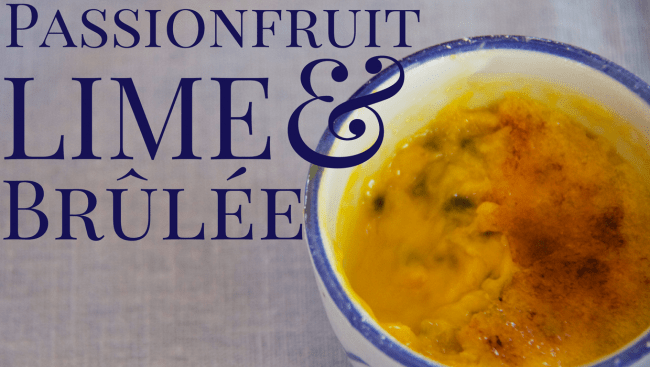 Combine the passionfruit pulp, lime seat and juice in a bowl. In a separate bowl beat the sugar and egg yolks together until pale. Then add the cream and the passionfruit mix and beat together. Carefully pour the custard mix into ramekins. Fill a baking dish with water and bake the ramekins in the water bath for 40 minutes. The cooking time will vary depending on the size of your ramekins – aim for set with a very slight wobble. Remove from the oven and allow to cool. Before serving, dust the tops of the ramekins with icing sugar, then caramelise with a blow torch. This custard also makes a great pie filling. Blind bake your pie case, then carefully pour the custard into the tart cake and bake at 140ºC (fan forced) for forty minutes. Remove the tart from the oven and allow to cool completely before dusting with icing sugar and caramelising with a blow torch. Makes 6-8 brûlées or 1 pie and four petite brûlées. Dinner was fabulous fun and the slow, cook-your-own nature of the raclette was the perfect antidote to my week’s conversation shortfall. We laughed, we drank and we ate loads and loads of cheese covered goodness. are you a girl who just wants to have adult conversation? *While we’re on the topic of the Pontif. Last week he ditched the Pope-mobile and this week he excommunicated the Mafia. Do you think he’s in a hurry to meet the Big Guy? I miss adult conversation but I’ve booked my sissies in for some soon! The pope, gone mad I tell you! A girls weekend in Byron sounds divine. Have fun Eva! I’m a real sucker for any “brulee” recipe, love love them, not much good at making them though!! I have a healthy respect for the blow torch too Mandy!